Leukaemia is a cancer that affects the blood and bone marrow where blood cells are made. All leukaemia starts in the bone marrow where developing blood cells, usually developing white cells, undergo a malignant (cancerous) change. This means that they multiply in an uncontrolled way, crowding the marrow and interfering with normal blood cell production. Increasing numbers of abnormal cells, called blast cells or leukaemic blasts eventually spill out of the bone marrow and travel around the body in the bloodstream. In some cases these abnormal cells accumulate in various organs including the lymph nodes, spleen, liver and central nervous system (brain and spinal cord). While the number of abnormal cells in the blood is increasing, the number of normal red and white blood cells and platelets is decreasing. This means the remaining red blood cells cannot transport as much oxygen to the body’s tissues and organs; the normal white blood cells cannot effectively fight infection; and the platelets cannot ‘plug’ all the ‘leaks’ in the blood vessels. The leukaemia patient may therefore experience some of the symptoms or signs of particular blood cell shortages. For example, red blood cell loss would lead to fatigue and pallor (anaemia), white blood cell loss would lead to repeated infections, and platelet loss would lead to red skin blotches, numerous bruises, and nosebleeds. This explains why leukaemia results in anaemia, bleeding and infections. 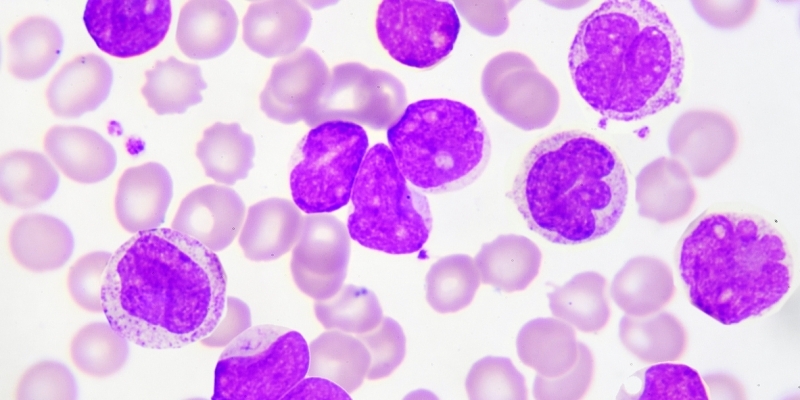 Acute leukaemia is characterized by a rapid increase in the number of immature blood cells. Crowding due to such cells makes the bone marrow unable to produce healthy blood cells. Immediate treatment is required due to the rapid progression and accumulation of the malignant cells, which then spill over into the bloodstream and spread to other organs of the body. Chronic leukaemia is characterized by the excessive build up of relatively mature, but still abnormal, white blood cells. Chronic leukaemia develop more slowly and may not need to be treated for some time after they are diagnosed. Combining these two classifications provides a total of four main categories.